OWYN Vegan Protein Review: My Favorite Protein to Date? You guys asked for Owyn Plant-Based Vegan protein powder reviews and that’s exactly what you’re going to get. in this Owyn review, I’ll talk about the SIX flavors of Owyn and let you know which of them is the best. I’ll include my personal rankings of all six Owyn flavors in this section. The next thing we’ll do in this Owyn Protein review is discuss the formulation. What types of vegan protein are in here? Pea? Soy? I’ll tell you. I’ll also talk to you a little bit about the Owyn packaging because I’m into packaging, as you very well know if you’ve read any of my reviews. So. That’s pretty much it! Time to ‘Owyn’ this review. What is the Best Flavor of Owyn Vegan Protein? Cold Brew Coffee: The first flavor of Owyn Plant-Based Vegan Protein that I tried was the coffee flavor. I think most of you guys love coffee like me so this will be interesting for you to hear about. This Owyn flavor was actually bitter like real coffee, and didn’t have too much sweetness at all. I thought the texture was average and overall a rather bold, distinctive drinking protein. It is alarming how bitter this Owyn flavor is at first, but once you adjust to it, it is very drinkable and I venture tasty. Dark Chocolate: The flavoring guys at Owyn sure aren’t afraid to be bold with their flavor development, this much I know. The dark chocolate flavor, like the coffee flavor, boasts an extremely bold, even bitter, flavor profile. The sweetness was once again over-powered by the dark chocolate bitterness. I found this flavor to be just a little too polarizing and overwhelming for my palette. Matcha Tea: Well. I feel like a broken record at this point. For those of you sensitive to that ‘tea’ taste, this Owyn Vegan protein flavor is NOT for you. I personally don’t like green tea so this flavor was a huge turn-off for me. It really does taste like green tea. Just like the first two Owyn protein flavors I mentioned, this one is also very strong and even bitter-tasting. Smooth Vanilla: FINALLY, a somewhat normal flavor. My friend Siobhan and I were literally rejoicing that somehow the vanilla didn’t have some kind of crazy spice or bitter to it. I really enjoyed this flavor actually. The vanilla was bold but in a good way, and you could actually sense some sweetness to it. Quite good. Tropical: I think this Tropical Owyn flavor might be a little bit redundant because strawberry banana is somewhat tropical already, but the tropical flavor is an interesting departure from traditional flavors. I kind of liked it despite it needing, again, some more ‘sweet’. 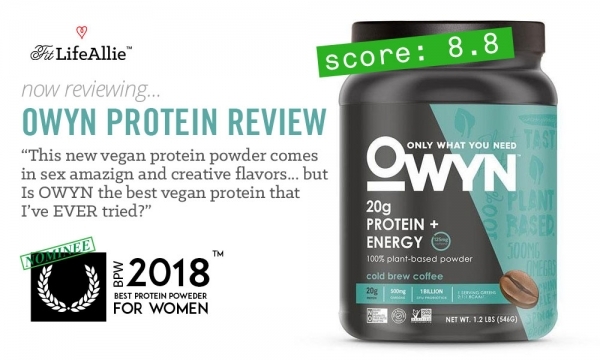 The theme of the Owyn Plant-Based Vegan protein powders is that they all could use a TOUCH more sweet, and maybe tone down the flavors themselves. But I give them huge props for going off the beaten path to create distinctive flavors that not everybody else has. Big props. While the creative flavors are fun to try, I do think that the best flavor of Owyn Protein is the Smooth Vanilla. It has the best overall flavor and is most balance with it’s sweetness level. Ok let’s talk about what’s actually in the Owyn vegan proteins now. What’s in Owyn Vegan Protein? So. That is as pretty attractive ingredients list to me. I like that Owyn included some superfoods that make it a little more comprehensive as a meal or snack replacement. I think the Owyn protein sources themselves are very respectable, even if they did place it ‘safe’ by using pea protein as their main source. But probiotics and veggies are indeed a nice touch. Let’s talk about the macros now. NOTES: These macros are pretty standard for a vegan protein. 20 grams of protein per serving is quite high, and you can also see there are four grams of real sugar in here as well. My only eyebrow-raiser here is the sodium, which, at 300mg, is a bit higher than the usual. I’m going to appoint Owyn a 9/10 on the formulation. I think they’ve done a nice job in creating a creative, yet clean vegan protein powder formula. Let’s round up the review with a discussion on the packaging. Owyn Protein Packaging Looks Sharp. Owyn Vegan Protein looks the part, I will give it that. Often times these Vegan proteins will look super generic and get lost in the deep sea of white and green vegan and greens products. Just go into Whole Foods and you’ll see a wash of white and green. Products like the Ground-Based Superfood protein will start to blend into one whole wall of generic-looking products. But not Owyn. Owyn Vegan protein, similar to other creatively-packaged Vegan options, like Ora Organic, or Tropeaka Vegan protein, looks very unique and colorful. The Smooth Vanilla Owyn protein flavor, for example, boasts a modern, clean, color scheme of metallic blue and teal. In fact each color has it’s own unique color scheme. It’s marvelous to look at and a testament to Owyn’s hard work in the design studio. A subtle and playful vegan graphic fills the complementing color area along the left side of the label, adding some intricacy to each label without adding clutter. -OWYN utilizes a simple protein blend with a few carefully chosen extras like green veggies and probiotics.